Dereham town, also known as East Dereham, is in the District of Breckland, on the A47 between King’s Lynn and Norwich and in the centre of Norfolk. This means there are three council areas in Dereham: Norfolk County Council which deals with big issues such as highways and schools, Breckland District Council which deals with planning and land issues locally, and Dereham Town Council which deals with issues that are local to Dereham such as foot paths, allotments, the recreation ground and the Memorial Hall. 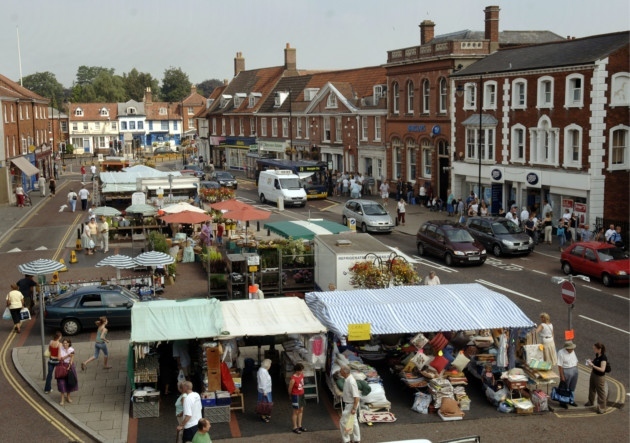 Today, Dereham is a vibrant market town serving many surrounding villages and has a considerable range of shops, ranging from national chains to local independents. There is a market held in the Marketplace every Tuesday and Friday and the town benefits from large, free to use, central car parks. Dereham is very centrally located and less than one hour away by car are the considerable attractions of Norwich and the lovely beaches of the Norfolk coastline. There is a rapid bus service to Norwich. 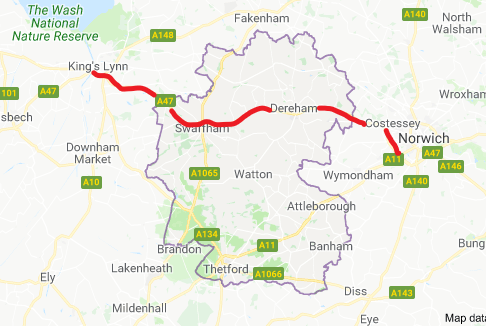 The railway between Dereham and Wymondham has been preserved, and is now operated as a tourist line by the Mid-Norfolk Railway Preservation Trust. This charitable company also owns the line north towards County School railway station. It is restoring the line towards North Elmham and aims to eventually relay the line to Fakenham. Dereham has a well stocked and modern library, located on the High Street and very close to the Dencora car park off Commercial Road (two hours free parking). There is a recycling and re-use centre operated by Norfolk Council situated in between Roy’s of Dereham and the McDonalds, off Yaxham Road. This centre also has a Reuse Shop, where you can buy or donate unwanted items, including things like crockery, records, books, bikes and furniture. You can also buy compost at recycling centres. Dereham Hospital provides professional rehabilitation services plus a range of clinics and is situated off Northgate. There is no Accident & Emergency at this hospital. There are hundreds of clubs and societies catering for just about every hobby and pastime that you can think of. These are listed here and you can search by organisation type. Dereham also has a lively cultural scene with a programme of events and performances at the Dereham Memorial Hall, ranging from meditation to music and drama. Dereham Blues Festival is an annual event taking place over four days every July and providing over 100 blues music performances in free entry town centre venues. Dereham Carnival also takes place annually in July and celebrates many of the small clubs and societies which contribute to the life of the town. The Carnival Committee raise money for local good causes including the Xmas Lights Switch-On. 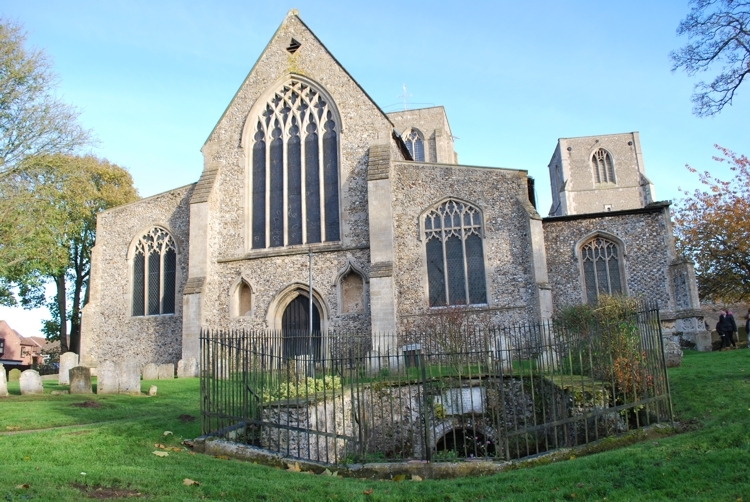 The name Dereham is traditionally explained by a miracle of St. Withburga, one of the daughters of King Anna of East Anglia, in the eighth century. In answer to her prayers, two deer appeared every day during a famine to provide milk for the nunnery she had founded. When a huntsman came along and tried to catch and kill these deer, he was overtaken by divine retribution, thrown from his horse and killed. 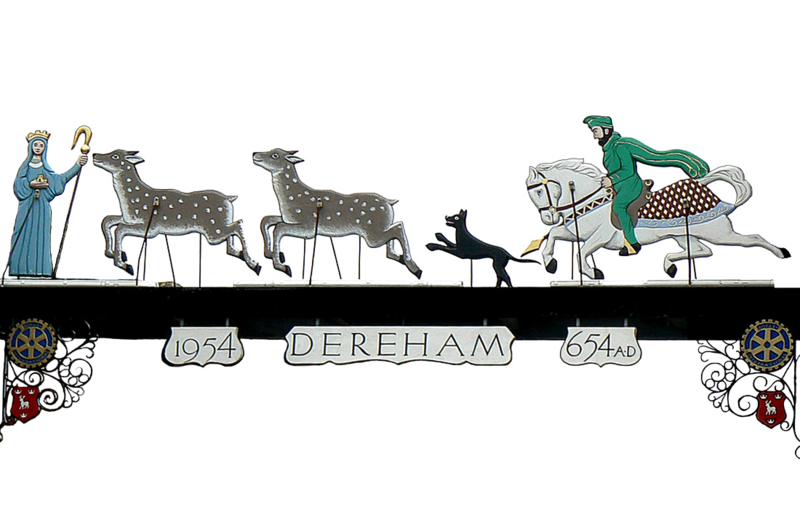 This hunt is today depicted on a rare town sign, across the entry to Butter Market from High Street. The town lies on the site of a monastery founded by Saint Withburga in the seventh century. A holy well at the western end of St Nicholas’ Church supposedly began to flow when her body was stolen from the town by monks from Ely, who took the remains back to their town. An attempt was made in the 18th century to turn Dereham into a new Buxton or Bath by building a bath house over Withburga’s Well. It was described at the time as a hideous building of brick and plaster, and was never popular. The local vicar, Reverend Benjamin Armstrong, obtained permission in 1880 to pull the building down. The spring was then protected by iron railings, but fell out of use and became choked with weeds. Since 1950, however, it has been kept clear of weeds—although the railings still prevent access to the waters. 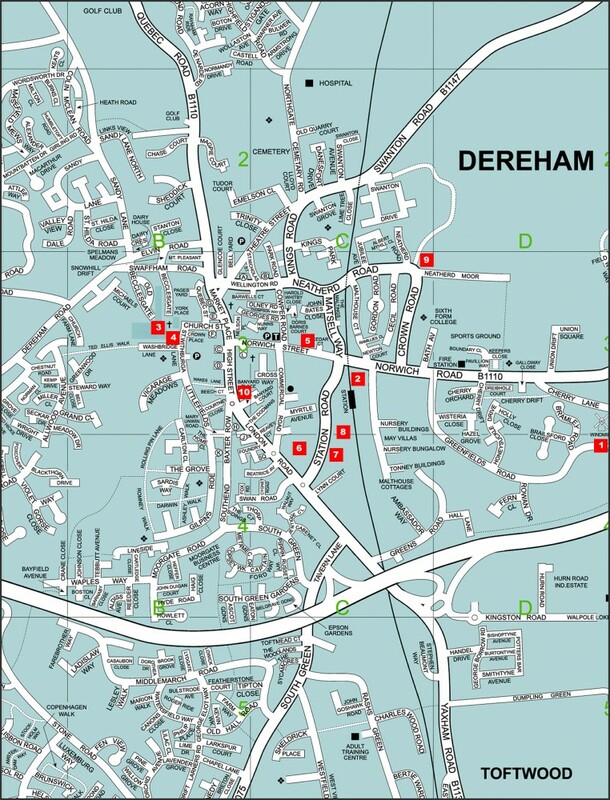 Click on the map above to download a printable version showing some of Dereham’s main tourist and leisure attractions.